If it is realy this decoder it should be doable. (2012-09-26, 02:40)Shivansps Wrote: Well empatzero build is a proof of concept only,(i think this is the lib that gimli rejected) i give it a go and well... it performs much better killing x11, but UI fps at 720P is around 40fps and 18-20fps at 1080P, considering the low idle cpu usage that has be running on hardware, im not sure if that what we have to expect from an Mali-400 single core. OK i quote myselft to correct... i was wrong, i double check my mkv files and some are in mpeg-4 not h.264, wrong label, sorry. Big Buck Bunny, both 720 and 1080P are running in Cedar Decoder, not software, 1080P lags because of low FPS from mali GPU. Like im playing the video, i try to go to the UI, is slow as hell both the video and UI, i go to see system info and the CPU usage is below 30% but the thing is running at 9fps... It works much better in 720P. Its obiusly a GPU performance problem. The XBMC crash for me at start of some videos for no reason, im cheking and those videos are all using MP3 audio codec, after that decided to test with mp3 music and it crash too, so the problem is around MP3 decoder in xbmc. BTW on the last screen, check "Sumary" and "Free Memory" thats whats happens when i playback something, sections of the screen jump up and down, and it gets worse depending on the video. No idea of what the problem is, i asume its Mali related too because sections of the UI moves up and down too whiout playing anything. I am new to this forum so not sure about the development status of XBMC on mk802 but here I am to share my experience about the empatzero's build. I have successfully cross compiled it with few adjustments to the rootfs and depends.mk file and built xbmca10.deb once the build is complete. Installed on a lubuntu from miniand and I was surprised with the result. Let me say, even though empatzero claims it 0.0.1 (alpha), I admit it's quite usable. 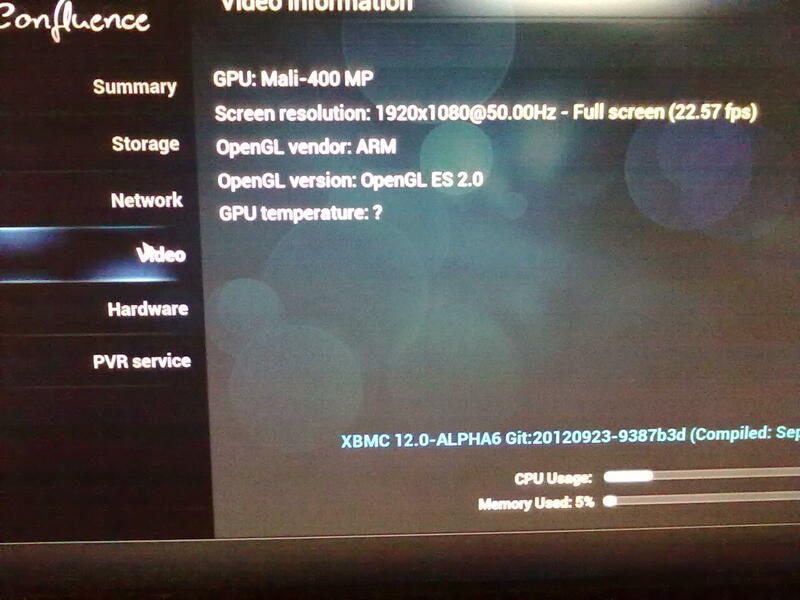 The XBMC UI is responsive and showing around 43-45 fps at 720p mode. Regarding the video playback, initially it crashed with a 1080p movie (h264 mkv). Then I tried couple of 720p and they played flawlessly so I assume it's using CedarX (Shivansps, how can I make sure it's not SW decoding). Then I again tried 1080p video, it crashed. I was so excited of the result that I gave it another try and surprisingly this time it played 1080p too without any major issue (some flickering initially). odroid Wrote: As you know well, the MFC includes a small ARM core and it need a firmware for video codec processing. The firmware is not an open source but the APIs are well opened. Android multimedia framework is also calling the MFC device driver APIs. So you can refer our Android BSP source code to start your project. But it may take very long time to port it to XBMC. I think so. So it sounds like that is all possible. I follow this thread for a while, also arm-netbook irc and ml. Great to hear that something's going on. I'm new to crosscompiling but I already managed to compile the parts (uboot, kernel etc.) and create a bootable sd-card with an debian rootfs for my mele. To go on with compiling an testing the xbmc, mali and x11 stuff I'd be glad to get some hints, where to find some help about a right set-up for a cross-compile-environment and howto do the thing itself. I'd prefer to get a sid-armhf as target-system, crosscompiled in a sid-amd64 virtual machine. Although using and playing with linux for years, I'm still a bit confused and unsure about mixing compilers, debian and ubuntu binarys etc. on different systems (Of course I know, thats not the best idea to use armel-bins on i386 ;-). 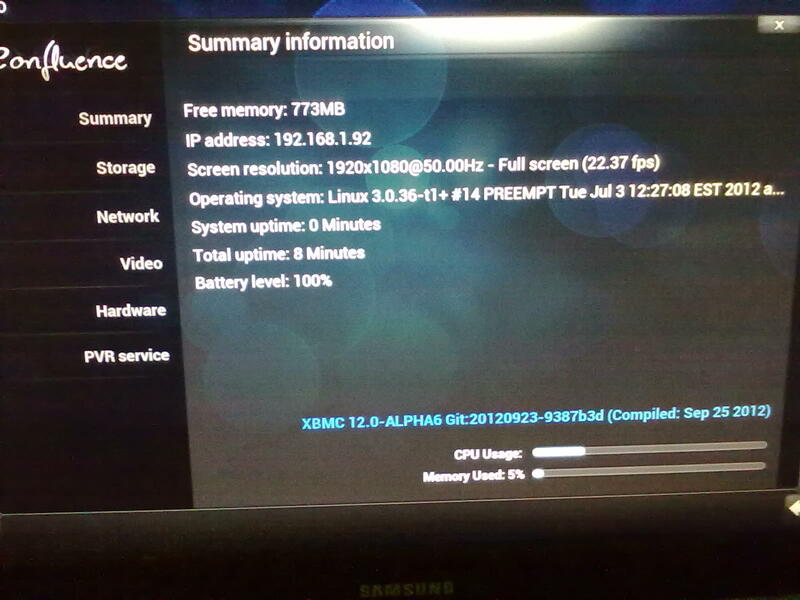 (2012-09-26, 11:42)cristatus Wrote: I am new to this forum so not sure about the development status of XBMC on mk802 but here I am to share my experience about the empatzero's build. I have successfully cross compiled it with few adjustments to the rootfs and depends.mk file and built xbmca10.deb once the build is complete. Installed on a lubuntu from miniand and I was surprised with the result. The crash issue is because of libmad on dev enviroment, those videos are probably using MP3 audio. 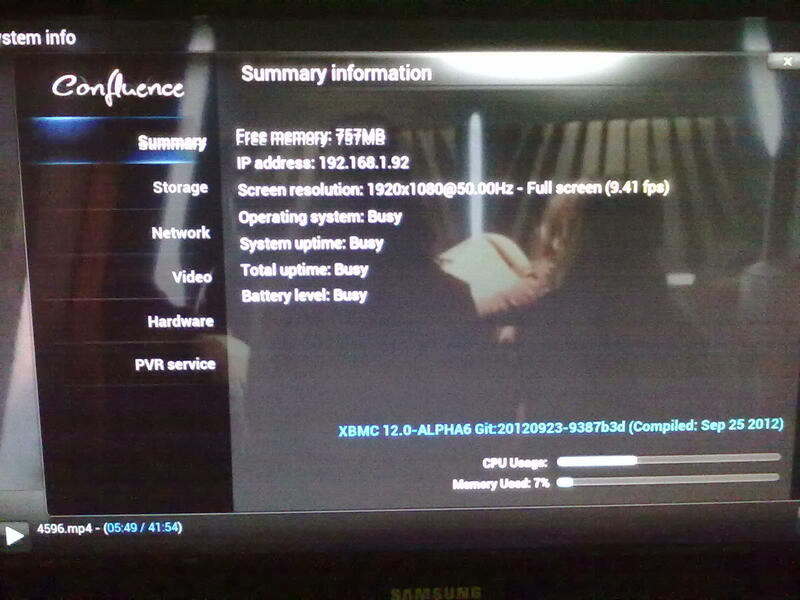 As for SW or HW rendering, play a video and then open /home/(user)/.xbmc/temp/xbmc.log, search for "A10", and see if its failling or opening... But right now it only supports H264 and MPEG2, but its not a cedar problem. (2012-09-26, 15:00)Shivansps Wrote: The crash issue is because of libmad on dev enviroment, those videos are probably using MP3 audio. I have tested again with debug option enabled. All the three small HD movies I played previously worked till the end. The debugging info shows FPS between 16-25fps and 35-50% cpu usages (during video playback). It's same for both 1080p as well as 720p movies. 21:39:03 T:1230066752 DEBUG: A10: cedar open. Well dvdplayer is rendering on Mali, thats why is slow, and if you have a 720P resoution there should be no diferences in a 1080P or 720P movie. rendering GUI is not the same as rendering a yuv video. please don't confuse the two.